Growing up as a fat girl, Virgie Tovar believed that her body was something to be fixed. But after two decades of dieting and constant guilt, she was over it--and gave herself the freedom to trust her own body again. Ever since, she's been helping others to do the same. Tovar is hungry for a world where bodies are valued equally, food is free from moral judgment, and you can jiggle through life with respect. 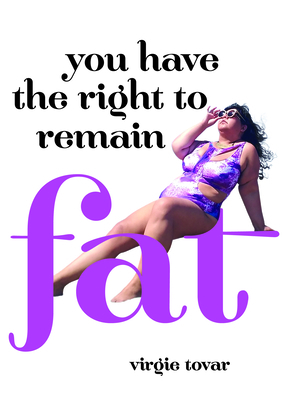 In concise and candid language, she delves into unlearning fatphobia, dismantling sexist notions of fashion, and how to reject diet culture's greatest lie: that fat people need to wait before beginning their best lives. Virgie Tovar is an author, activist and one of the nation's leading experts and lecturers on fat discrimination and body image. She is the founder of Babecamp, started the hashtag campaign #LoseHateNotWeight, and edited the groundbreaking anthology Hot & Heavy: Fierce Fat Girls on Life, Love and Fashion (Seal Press 2012). Virgie has been featured by the New York Times, MTV, Al Jazeera, NPR, the San Francisco Chronicle, the Huffington Post, Cosmopolitan, and BUST.